The Gast Rotary Vane Vacuum Pump gives you smooth pulse free air flow, without the need for receiver tanks. This compact vacuum pump is simple to use and efficient to operate, using electromagnetic oscillation, and eliminates the need for sliding parts, therefore minimizing power consumption. The lack of sliding parts has the added benefit of removing lubricants, so air exhausted from the vacuum pump is clean and particle free. This also means that air flow from this rotary vane vacuum pump is steady, making it ideal for applications that need a consistent pressure. The Gast Rotary Vane Vacuum Pump is ideal for environmental, medical, and graphic arts applications, among others. This rotary vane pump features rugged construction, portable and low maintenance to care for. 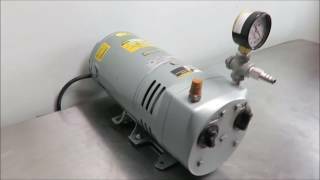 This Gast Rotary Vane Vacuum Pump has been thoroughly tested and performed to expectations. All of our lab equipment comes backed with our standard warranty. Should you have any questions, please don't hesitate to contact us.